For the longest time, Yoga was a mystery to me. I thought it was just a lot of woo woo and weird stretches. I had a number of friends who swore by it, but I just couldn’t see me getting into it, that’s for sure. A number of years ago, when I first did P90X, there was a Yoga day. I dreaded it. It was 90 minutes long and I wasn’t up for that. But, a crazy thing happened. With some modification and by doing an abbreviated version of the workout, I began to see the benefits and the results. To my surprise, I began looking forward to Yoga day. But, you may ask, “Why call it QuasiYoga?” Glad you asked! Let’s start with the definition of “quasi.” It pretty much means “almost, but not quite.” So why would I want to go there? Actually, the idea is to take some of the perception of the exclusive, almost religious edge off of Yoga. What you won’t find here is any Eastern mystic woo woo. What you will find is an attainable series of exercises that is senior and beginner friendly. Thus the byline, “Yoga for the rest of us.” In this program, I don’t assume anyone knows the first thing about Yoga. Every move or pose is thoroughly explained, demonstrated and given context. Nothing is left to the imagination or to figure out on your own. I work with many seniors and with people who have a lot of weight to lose. Others have knee, back and shoulder issues to contend with. This program not only allows for these challenges, but addresses them directly. The goal is not to merely accommodate the challenges, but to aid in rehabilitation. There are progressions in each routine that, when followed, will broaden and intensify as you build strength and gain confidence. As with any exercise program, you would need to get an OK from your doctor before starting. So, forget about the woo woo and the weird poses, like the guy in the picture. We’re here to fight back against the forces and challenges that have held us back for way too long. QuasiYoga takes you on a journey that you can enjoy along the way. It doesn’t just keep you longing for some elusive destination. Another thing you won’t see here is a cast of ridiculously fit young people doing everything perfectly and revealing the legal limit of skin. This is real world. Hey, I’ll be in there, too and I’m well into my 60’s. This is ground level stuff that provides the common man and woman an accessible portal and sustainable path to better health and fitness. 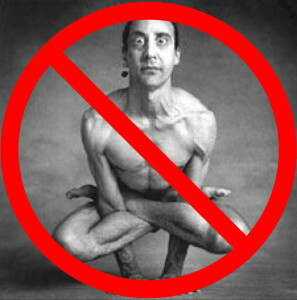 Now that you are wanting QuasiYoga so badly you could taste it, I’m sorry to inform you that it is not yet available. I will be rolling it out over the course of a year. The first thing that will be publicly available are short YouTube videos that will be demonstrating the various moves and poses. At a later date, I hope to put together a series of 15 to 30 minute videos of the different routines. If you would like to be the first to know of the release of the videos, just sign up on my email newsletter list. Don’t want to wait until it starts rolling out? Good! I’m looking for some volunteers to try out the program and give honest feedback. Those of you who sign up for the test group will be seeing the videos before they go up on YouTube. You will be able to be a part of the development and direction of the program while benefiting from the workouts. Of course, there is no cost to be in the test group and the only equipment you will need is a mat. You can follow this link to our QuasiYoga Facebook group and request to join. For those in the Pensacola area, we have a group that meets on Saturday mornings, but we have people from many states in the group following via Facebook or on the email list. This is going to be an interesting journey and I look forward to having many of you along for the ride.